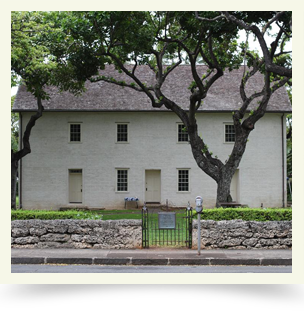 Hawaiian Mission Houses Historic Site and Archives is located in Honolulu’s Historic Capital District and serve as the leading authority on Protestant missionary history in Hawai‘i. It is known worldwide as the place where the Hawaiian written language was developed through the collaborative efforts of the missionaries, the Hawaiian royalty, and the Hawaiian people. It preserves the two oldest existing houses in Hawai‘i, which were built and used by missionaries in the early 19th century, and the largest collection of Hawaiian language books in the world. The Hawaii Society has contributed to the education programs and the reinterpretation of the cellar. The Hawaiian Mission Houses Historic Site and Archives (HMH), owned by the Hawaiian Mission Children’s Society, includes three restored houses, two of which are the oldest houses in Hawai`i, and a research archives which provides a unique glimpse into 19th-century Hawai`i both onsite and online. From Waikiki, take Ala Moana Blvd about two miles. Turn right on Alakea St. Turn right on King Street. Turn right on Kawaiaha'o Street.